This article has new content coming soon from Joker's Wild and may not be complete, confirmed, or correct. Please update it as soon as any relevant and accurate material is available. Editors must cite sources for all contributions to this article. Edits that do not follow this standard will be reverted without notice. For more information, see the Citation Policy. "The process is simple: an aperture opens, like a jaw, and swallows a living thing. It passes into — another place. Later, it returns. What returns is... I try to use the word ‘shadow’ but Eris hisses at me [...] insists that these Taken are more real, somehow. She uses words like inhabited, exalted, rendered final... [...] My Hidden tell me that the Taken shine with seething, negative light. As if the universe is curling up around them. As if they radiate some pathology that decays into our world as nothingness... The Taken serve Oryx. But I think those jaws lead elsewhere." The Taken are beings originating from multiple species that have been corrupted by the Darkness and altered to better serve its purposes. Once used by Oryx, the Taken King as his personal army, they have more recently been utilized by other powerful Darkness-aligned entities in the wake of Oryx's defeat, including Savathûn, the Witch Queen, Quria, Blade Transform, Xivu Arath, God of War and the Taken Ahamkara, Riven. 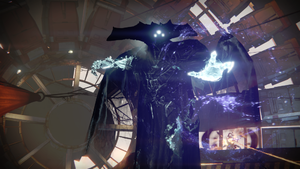 The Drifter, a rogue human Lightbearer known for experimenting with the Darkness, has also managed to achieve a level of temporary control over the Taken. "IMPERATIVE CORRUPTED. SEEK LIGHT. DESTROY LIGHT. OBEY THE COLLECTIVE MIND, OBEY THE #$422*! ORYX. OBEY ORYX." The power to create Taken is granted by the Darkness itself, and is bestowed only to its most formidable servants. The process of Taking involves summoning a portal or aperture that rips an individual out of the universe and transports them to an unknown location within the Ascendant Realm. There, the Taken being encounters an unknown entity (presumably the Darkness itself), who offers them a way to overcome their former weaknesses. The Taken being then returns to their original universe with new paracausal abilities and a compulsion to serve the one that Took them. Taken resemble their former selves for the most part, but are both shadowed and eerily glowing, with a blindingly bright orb typically obscuring their facial features. Many Taken are seen to shiver or twitch in a disturbing manner, and their vocalizations are warped into shrieks and howls. Over time, exceptionally powerful Taken have been seen to grow pairs of black, curving spikes from their bodies. The Taken constantly exude a substance called Blight, which resembles a shadowy liquid or gas charged with energy. Wherever Taken have become entrenched, spherical aggregations of Blight are commonly seen; these seem to serve a variety of purposes, including shield generators, area-denial, and interdimensional communication nodes. 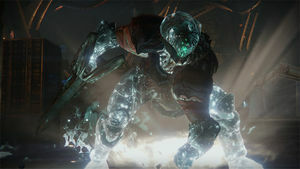 Taken versions of enemies have radically different behaviors from their standard counterparts, including new abilities designed to counter Guardian abilities. 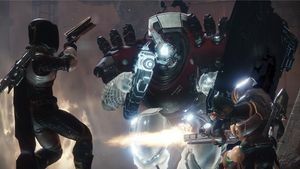 Groups of Taken can be mixed with members of different species, and can appear on Earth, Venus, Mars, Dreadnaught and Io in most activities; on the Moon, in select Destiny Story missions and certain Patrol activites in both Destiny and Destiny 2. Taken are unwaveringly loyal to their master, and will turn on former allies without hesitation. Even strong-willed enemies such as Vex Axis Minds or Cabal commanders are incapable of resisting this change. Although new Taken can only be created through the Taking of new victims, existing Taken will remain (albeit aimless and disorganized) indefinitely if their master is killed. A sufficiently powerful being with the ability to Take can assume control of Taken previously generated by a different individual. While all Taken are enslaved to their master's will, more powerful Taken retain a degree of independent thought and initiative, mostly at the discretion of the master themselves, to "keep them interesting." After Oryx's defeat, the Taken Knight Malok, Pride of Oryx, attempted to seize the vacant throne for himself. Other Taken, such as Noru'usk, Servant of Oryx, have aspirations to ascend while many, like Keksis, the Betrayed, are lost and leaderless. With the advent of the Red War, Taken activity spiked and was more coordinated. Ikora hypothesized that the Taken were no longer leaderless, with signs pointing to Savathûn being the one controlling the Taken, possibly claiming the power to Take for herself. Throughout the events of Forsaken, Kalli, Shuro Chi, and Sedia were able to be "cured" of their Taken influence, proving that it is possible for some beings to reverse the process. "The Hive entity Oryx/Aurash is deploying a paracausal ontopathogenic weapon that infects and subverts Ecumene forces. The weapon operates on individual targets. Targets are abducted and returned as compliant Hive slaves with inexplicable and physically illegal abilities. All Ecumene clients should IMMEDIATELY devote all economic and cognitive resources to a countermeasure. Fight hard. We stop the Hive here, or see our galaxy devoured." In the distant past, the Hive god Auryx sought to obtain the power to Take in order to help him defeat the Ecumene. He killed his two sisters to gain an audience with Akka, the Worm god of Secrets, whom he then slew in turn. Auryx stole the secrets from its flesh and wrote them upon a set of tablets he named the Tablets of Ruin. After speaking to the Deep directly, he returned, mantled as Oryx, the Taken King. With this new power Oryx waged war upon the Ecumene and defeated them utterly over a period of one thousand, one hundred and forty years, in the process conjuring back his two sisters in the same way he had killed them. During the Golden Amputation Oryx Took the Emperor Raven and assured the defeat of the Taishibethi When the Vex invaded his Throne world Oryx Took and turned them against one another, eventually expelling the cybernetic machines from his domain. Later, aboard the Nicha Thought-ship Oryx encountered and Took Quria, Blade Transform, the Vex mind which had orchestrated the organized invasion of his Throne, and later gifted it to his sister Savathûn as a present. 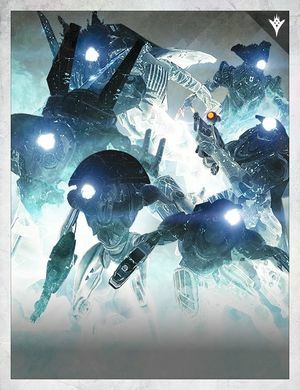 The Taken War was a major, system-wide conflict fought between the Hive, led by Oryx, and all other races in the system. The war began as a direct result of the Guardians slaying Oryx's son Crota, to stop an attempted invasion of Earth. Oryx brought his fleet to Saturn and made free use of the power to Take in his assault on the Solar System. He Took Fallen, Vex, and Cabal in enormous numbers, besides his own Hive and began blighting the system with his Taken forces. When he unleashed his Dreadnaught's superweapon against Queen Mara Sov's fleet, he also Took the Techeuns Sedia, Kalli, and Shuro Chi, and through them was able to invade and corrupt the Dreaming City, where he Took the Ahamkara Riven. Some time after Oryx's death, Savathûn assumed control of the Taken, apparently through the Taken Vex Quria, Blade Transform. Two years later, during the events of the Red War, the Taken invaded the European Dead Zone and corrupted a forest outside of the Traveler's shard. Certain Taken had also mutated physically, developing two large, curving spikes on their backs. A Red Legion commander was also somehow converted into a Taken, even though Oryx had been defeated prior to the invasion. Ikora commented that these Taken were no longer leaderless, but had to be acting under a new higher power. During the events of the Dark Alliance Adventure, Red Legion Psions successfully used their powers to steal and infuse Taken energy into themselves and their superiors, empowering them with Taken-powered weapons and shielding. However, this effort was stopped by The Guardian. On Io, it was discovered by Ikora and Asher Mir that the Taken had established a foothold after being drawn there by remnants of the Traveler's Light. When they attempted to summon a large number of Taken to overtake the moon, The Guardian intervened and disable the portal they had conjured. They also found a way to turn the local Vex into more Taken, with the intention to take a Vex mind and breach the Vex's network to control the Vex as a whole. This plan, however, was discovered and stopped by The Guardian also. The Dreaming City at the end of three weeks. The Drifter, a rogue Light-bearer, somehow managed to assume control of several Taken, and employed them as part of a game called "Gambit". Among these Taken are exceptionally powerful and ancient Taken known as Primevals, which he can summon using Motes of Darkness. The Dreaming City continued to be infested by Taken and their blights. 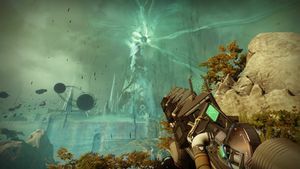 After the Dreaming City's unsealing, the Taken Riven within it baited a group of Guardians into killing her, allowing her to unleash a curse on the city that increasingly worsened its condition. Within three weeks, Taken energies had saturated and engulfed huge portions of the city. However, upon the death of Dûl Incaru, the Eternal Return, the Dreaming city reverted back to the state it was in when the curse was first unleashed. The curse then spread in the same manner it had previously, with it being revealed that the curse trapped the Dreaming City within a 3-week time loop that resets whenever Dûl Incaru is killed. Through messages left by an unknown sender, it is revealed that the curse was made possible through the power Riven gained upon her "death", and modeled upon Vex simulations overseen by Quria, Blade Transform. After the Drifter unveiled Gambit Prime and The Reckoning to the Guardians, the Praxic Warlock Aunor determined that he had obtained the ability to create "counterfeit" Taken Primevals by coupling his banks to the "haul" gifted to him by the Nine. Among these entities are the Likeness of Nokris, Likeness of Oryx, Counterfeit Servitors and Counterfeit Hydras. "There are no adequate words to describe the experience of being Taken. We would need a sensorium." Taken Vandal—summons a spherical shield similar to Ward of Dawn. They are armed with Solar Wire Rifles and Arc Shrapnel Launchers. Taken Captain—sends out moving balls of Darkness to blind Guardians and are armed with Arc-damage Shrapnel Launcher or Arc Blades are used and Solar-shielded. Chimera—Taken Servitors. Fires blasts of Void energy and occasionally bursts of Axion Darts. Can summon Blights that grant them immunity until they are destroyed. Notable Chimera include Voice of Riven, Xaras, Greed of Xivu Arath and Inomina, Plague of the Well. Taken Thrall—ability to teleport short distances in an instant, and do Solar-damage with their melee. Shadow Thrall—a shadowy imitation of a Thrall summoned by Taken Wizards, and do Solar-damage with their melee. Taken Acolyte—deploys Acolyte's Eye turrets and are armed with Arc Shredders, which fire projectiles in an arc that can attack from over short cover. Taken Knight—fires explosive, lingering Solar jets in a wave for area denial, teleports short distances to evade attacks. They are armed with Void Boomers, which fire bolts with higher velocity and do not suffer gravitational drop. Taken Ogre— does Arc damage with both its eye blast which also knocks opponents back if they're in the air along with a ground slam if a enemy comes too close. Taken Goblin—when in close proximity to an ally, they can generate an invincible shield for it. Armed with either a Void Slap Rifle or a Solar Torch Hammer. Taken Hobgoblin—fires a fast-moving, Shrieker-like projectile when struck in self-defense. Equipped with a Void Line Rifle. Taken Minotaur—always cloaked unless shot at enough. Equipped with a Solar Torch Hammer. Taken Psion—has the ability to multiply itself, splitting and creating another Taken Psion with full health and wield an Arc Slug Rifle. Taken Psions fire their Slug Rifles very rapidly. Taken Phalanx—Can fire Arc blasts from their shield that can push Guardians, much like the physical shields themselves, and are armed with an Arc Slug Rifle. Taken Centurion—has an Arc-shield, can teleport short distances, and is armed with a Void Projection Rifle. Fires slower moving Axion Darts, much like the Voidwalker's Axion bolt, that tracks targets and deals Void-damage—these can reach enemies around corners easily and can be shot and detonated to avoid damage. Taken Blight—a sphere of Darkness that can appear procedurally in the world. The Blight can summon Taken ambushes, which can include named characters that drop runes. Acolyte's Eye—a stationary unit deployed by Taken Acolytes. It is an orb of Darkness energy that fires Arc energy at enemies, and detonates in an Arc blast when destroyed. They survive the death of their summoner. "[T]hat dying Thrall was no monster. It was in ecstasy. I felt the power as my knife bit home. I heard their song, for just a moment. I will hear it again. Oryx is the Truth. And I will have it." Based on Grimoire analysis it can be assumed that the victim willingly chooses to be enslaved. It is unknown if any victims have ever rejected the Darkness. This power is described by the Ecumene as an "ontopathogenic" weapon, infecting and subverting soldiers and giving them "physically illegal" abilities, not unlike the Superpower Wiki's description of "infect[ing] the very nature of the subject's existence". Moreover, in the same article, Ontopathogenesis is described as also infecting the metaphysical reality of a creature, matching the language of The Taken Grimoire cards. In Destiny 2 while most of the Taken remain largely the same in appearance, some Major and Ultra Taken appear with the trademark black bodies but their white eyes and glow is gold rather than the standard white along with crests on their back. Some concept art of the Taken shows them being able to Take other enemies although this is never seen in game. "Dark Patrol"; concept art of the Taken from Destiny's Pre-Alpha phase. Concept art of a Taken Ogre, Ta'aun, and a Taken Dreg. Concept art of a Taken Knight transforming a Cabal into Taken. A Taken Knight shown to have the ability to take multiple units at once. The Seditious Mind, a Taken Hydra. A Taken Centurion in the European Dead Zone.